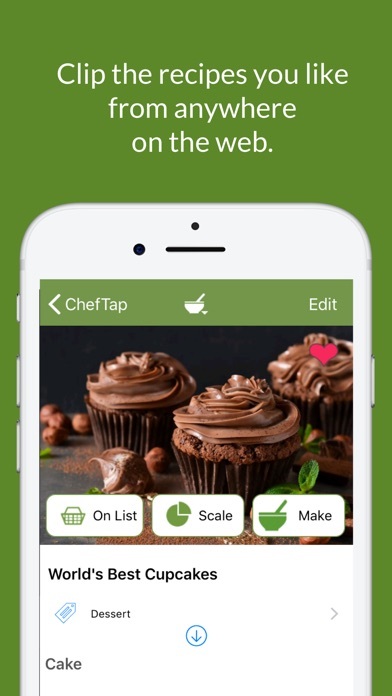 ChefTap is the only app that can automatically clip recipes from any website. No, really. No highlighting text, no cutting and pasting, and no list of ‘supported sites’. Just share any English language web page with ChefTap directly from your mobile browser and it’ll take care of the rest. 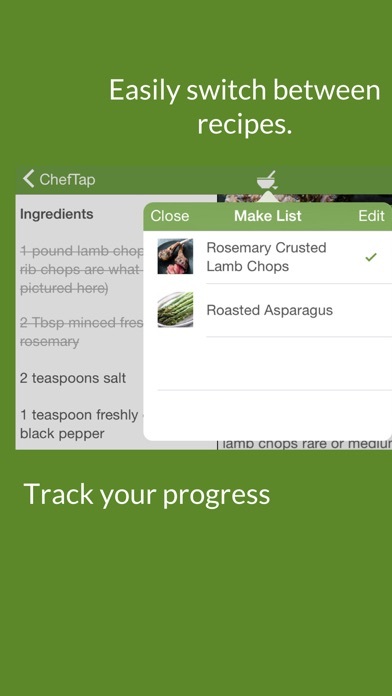 ChefTap clips recipes from any website and saves them in your own permanent archive so you'll never lose another recipe again. Have a favorite food blog? No problem! ChefTap will clip those recipes too and give you a link to the original post in case you want to refer back to it. When it’s time to cook, ChefTap displays recipes in a kitchen tested easy-to-read format on both phones and tablets. You even can search millions of recipes on the web and clip them into your collection without ever leaving the app. 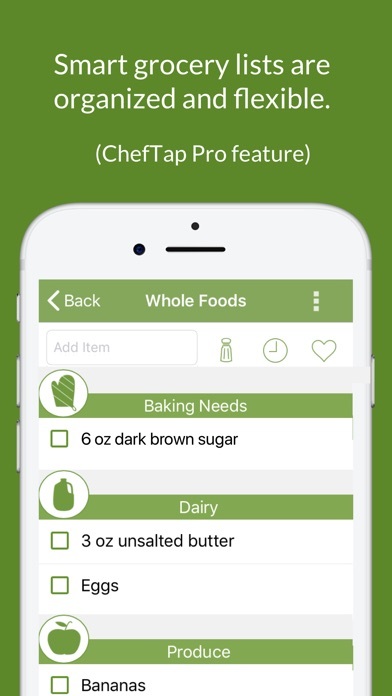 ChefTap is grocery lists makes it easy to add the ingredients of a recipe to your shopping lists. ChefTap figures out what you need from the store and combines like items. ChefTap also figures out what section of the store each item on the list is located and sorts the whole list by aisle. 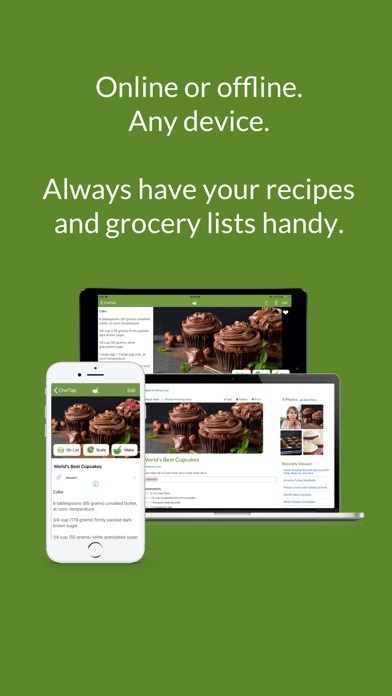 Features: - Clip recipes from any website or blog - Adjustable text size for easy reading on your phone or tablet - Save pictures of recipes from the web site, or attach your own - No network connection required to view your clipped recipes. - Sort by favorites, new recipes, recently prepared, recently viewed or alphabetically - Create your own tags like ‘Paleo’, ‘Vegetarian’, 'Cocktails' or 'Gluten-Free' so you can stay organized - Edit any recipe on your device - Clip and save up to 15 recipes without an account Sign up for a Basic account and get all of the above plus: - Clip and save up to 100 recipes - Try out smart shopping lists that automatically create grocery lists from your recipes - Try out intelligent recipe scaling that can even recognize written numbers like 'half a cup' - Sync devices with website (cloud backup) Once / week - View and edit your recipes online at cheftap.com Sign up for a ChefTap Pro website account and get all of the features above plus: - Clip as many recipes as your device will hold - Unlimited grocery lists - Unlimited access to recipe scaling - Sync devices with website (cloud backup) Unlimited - Sync devices with each other: Unlimited - Clip from your desktop - Priority support ChefTap can keep you organized in the kitchen so you can spend more time with family and friends. We are actively working on ChefTap, and we will be adding new features, including sharing recipes, meal planning, and more. We appreciate your feedback. Please visit our website, cheftap.com, and tell us which features you’d like to see. Has EVERYTHING I was looking for in an app. Can’t imagine what I did before this app! If you came to this app to put in your recipes, plan on paying. You have to “go Pro” to manually enter your own recipes. That is the most ridiculous thing imaginable to charge people for. I’m not paying to enter my own recipes, I’ll buy a physical book to write them into before I pay for an account yearly. Oh, and it only lets you save 15 recipes from the internet MAX before you, again, have to pay yearly to use the app. I’d sooner pay for the app itself than pay to use the thing yearly. Installed and it did nothing but crash. Unfortunate because it seemed promising. Over 50 apps working fine and this one just couldnt deliver. deleted. I freaking love ChefTap. I always lost the online recipes I used and there didn’t seem to be a good way to keep them all in one place, in an organized fashion, that was also accessible to my family. I love that we can add notes, pictures, retrieve missing text, see the entire recipe or ingredients list at once because the blogger’s pictures aren’t taking up space, and I don’t have to scroll past annoying stories just to get to the recipe. It seems like cheftap has thought of everything and recipe-saving is as absolutely convenient as it can possibly be. I paid for the pro subscription which is $19.99 and i don't think it's remotely worth that. Won't sync and I've lost track of lots of recipes because of it. On my way to look for something more trustworthy. Feel like I got cheated. I am very pleased thus far with the app. It does exactly what I want it to; clipping recipes from websites and consolidating them in one place. The interface is a little clunky but you can’t beat the price. Cheftap is quite simply amazing. Very straightforward to use and incredibly accurate with clipping. I honestly cannot say enough about it. It has made my shopping and cooking feel much more organized and go much more smoothly. I have never had any issues with it at all. Well done! 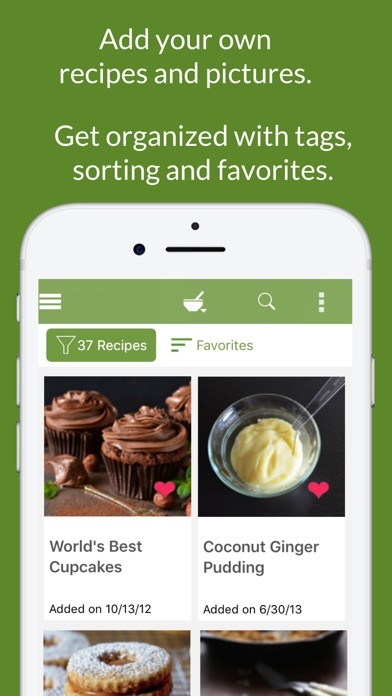 If you’re looking for an app to organize your recipes and generate easy shopping lists for you, you’ve found it! The registration link failed and I could not create an account making the app useless for my purpose. This app used to be great. It stopped syncing with my wife’s phone & the iPad. I deleted the app & reinstalled it. Now, I can not get past the “tutorial”. I hit skip and then it takes me to a page that says done but I’m unable to go further than the “done” page. Very frustrating as I am the “chef” in our house.